Sometimes, when playing around with our embroidery – whether it’s advanced or not – we forget some of the basic tips that help us achieve a good result with our handwork. So, for beginner’s especially, but also for more seasoned stitchers who’ve been dabbling for a while but might benefit from a refresher (or maybe there’s something here you haven’t tried yet? ), here are five had embroidery tips that lead to better results and that make stitching easier. They’re basic tips with links to tutorials. I’m a firm believer that now and then, it’s a good idea to go back to basics! The first tip is about the pull skein, which is the format that many popular threads are sold in (like DMC and Anchor stranded cotton, to name two). The purpose of a pull skein is to make using embroidery floss easy, right? You’re supposed to be able to pull a useable length of floss straight out of the skein, cut it and use it, and still have a tidy skein from which you can easily pull your next useable length of floss. That’s the idea. But sometimes, it just doesn’t work that way! Here’s an article that will help you conquer the pull skein and keep it (hopefully) from tangling into a jolly mess every time you pull some thread from it. Once you’ve conquered the pull skein and you’ve cut your first length of floss, you’ll want to do one very important thing to it, to get the best results with your stitching. This step is called “stripping” the embroidery floss. When using stranded cotton, you’ll get the best results with your stitching if you separate individual strands and then put the number of strands you want to use back together, before threading them in your needle. You’ll get better coverage with your stitches, your stitches will look more consistent, and the overall finished embroidery will be much neater if you strip your floss. Here’s a step by step photo tutorial on how to strip (or separate) your embroidery floss to prepare it for stitching. Now that you’ve figured out how to use a pull skein and you have stripped your embroidery floss, you’re ready to start stitching! But darn it…. that needle can be hard to thread, can’t it? In fact, are you sure you’re using the right needle? Here’s an article on selecting the right needles for embroidery and here’s an article on threading needles – read the comments below the article, too, as there are heaps of tips from the wider Needle ‘n Thread community in there! So, you’ve conquered the pull skein, you’ve stripped your floss, your needle is threaded, and it’s time to start stitching! How are you going to begin and end your embroidery threads while you work through your exciting new project? Don’t worry – there are several different and easy, secure ways to begin and end threads. Here’s a small collection of photo tutorials to help you choose a way that will work best for you. Now it’s time to stitch! But… what are you going to stitch? You have a design. You have some fabric. But how do you get that design onto that fabric? With surface embroidery, you don’t follow a chart when you stitch. The design lines are usually transferred onto the surface of the fabric somehow, and then you stitch over the design lines. There are So Many Ways to transfer embroidery designs – and different ways to do it, depending on your project. For example, you might transfer one way on light fabric and a completely different way on dark fabric. You might transfer one way for stitching on cotton flour sack towels, and a completely different way for stitching on a long-term goldwork project. Here’s an extensive list of different ways you can transfer embroidery designs, many with links to tutorials or to product reviews and suggestions. Make sure to read through the comments, too – there are many suggestions in the comments below the article! And now, you’re definitely ready to launch into your stitching! 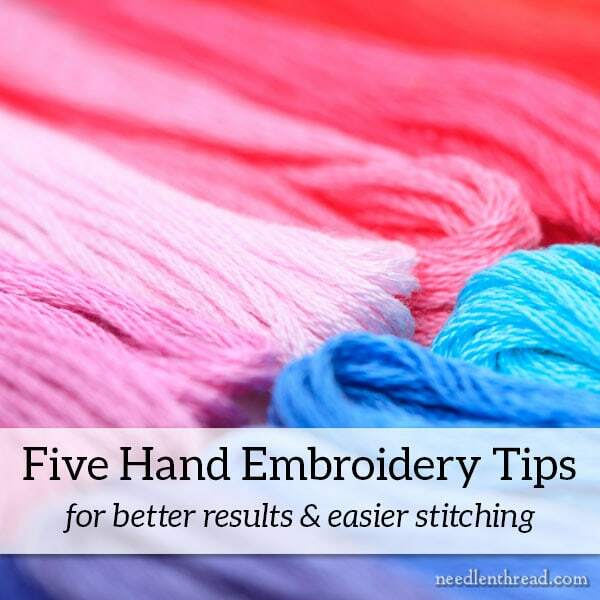 Those five tips will help you get started with hand embroidery. Of course, it helps to know a few stitches, too, I suppose! To help you choose what stitches to learn first, I’ve put together this list of the ten embroidery stitches that I think every embroiderer should know. If you have these ten stitches in your repertoire, you’ll be all set for a life time of stitching pleasure! Now, go forth and stitch! And have fun doing it! And of course, you’re always welcome to chime in below with questions or your own tips and suggestions! Thank you Mary for all those wonderful, helpful, interesting tips, suggestions and reviews you so generously regale us with. You’re right Mary. Always start any new endeavors with the basics. One tool I use consistently is a laying tool. I find that it helps to keep the threads straight and untangled. Love reading all of your tips and passing on your passion for needlework. These articles were very useful. Thank you. Wonderful tips, thank you. Your work is so beautiful, I am never disappointed when I come to your blog. Just finished reviewing your excellent embroidery tips as I am about to begin a piece “Poppies” as featured in “Inspiration”. When ending a thread while stitching with a blunt needle, I change to a sharp needle. Creates a secure finishing of the thread by piercing the stitches on the back of the work. Explain/demonstrate how to make a 90 degree corner/turn in stem stitch – preventing the floss from taking a “short cut” across the corner. Mary, you are an angel in disguise … what would we do without you??? These are very useful embroidery tips especially the starting and ending threads and how to use a pull skein I have read these articles before but it’s always good to go over them which I found very helpful. I always reference your site when I am starting a new embroidery project as you have the most useful tips and techniques around. Thanks for sharing these embroidery tips and techniques with us and for the photos and links. Love having tutorials. Thanks so much. Ideas. Thank you for the gift that keeps giving. Thanks for all these tips! They were wonderful. Now I have a question. I want to embroider a big piece in one of my Tshirts, but im confused about what stabilizer I should use. Do you have anytips for that?. Next Next post: On Needle Threaders – and a Really Small One!